You have just purchased the brand new DJI Mavic Pro and now you’re looking into ensuring its safety during travelling. If that’s really the case, I am happy to inform you that you have come to the right place! Why? 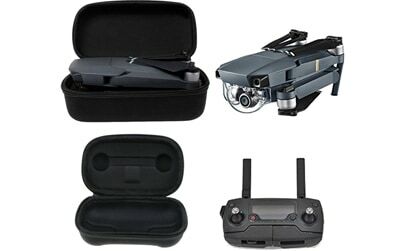 Well, because in the next couple of lines I will do my best to nicely portray some of the main features you can expect from a DJI Mavic Pro case. With that being said, I’ll cut the introductory paragraph short and jump straight to business! 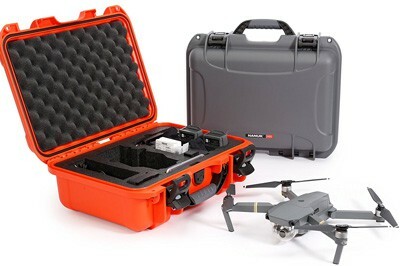 What to look for when buying a drone case? The first thing you should do when making a drone case purchase is ensuring it will fit your drone. When it comes to DJI Mavic Pro, you can consider yourself lucky as there are more than a few available on the market. The second thing is build material – you need to make sure your case is shockproof. By doing so, you are effectively ensuring your drone will not break if you accidentally drop the case on a hard surface. Shock proofing is usually done with hard-padded materials inside that are making a tight fit for your drone. Another thing you should look for is water resistance if you plan on carrying the case inside a compartment that holds your water/soda bottles as well. That’s pretty much it – with all those characteristics in place, you should be all set to make your decision! If you are not looking to spend a lot of money on your case, then Fstop might provide you with a solid option(s). The s inside those brackets is there because Fspot has more than 1 option. All their cases have similar design with decent water and drop protections, but the main characteristics are – you can buy separate cases for everything you might need. For example, you want a case only for your Mavic Pro… No problems, Fstop has a miniature case just for that. Oh, you want a case for the controller too… No problem, there’s a dedicated controller case as well. Batteries… No problem, Fstop features a case for 2 extra batteries. The main advantage of Fstop’s cases is their miniature size. Each of them fits the device it’s supposed to hold perfectly, allowing no room for additional items inside. They’re all sporting the same design and, at an incredibly low price point, are a great option for people who don’t consider themselves clumsy enough to drop their cases at a daily basis. Philonext brags about excellent build quality yand environmentally friendly materials… and needless to say, they have every right to do so. Their cases are well-built and sport a minimalistic design that’s incredibly easy on the eyes. Notice how I said cases and not case. Well, that’s because Philonext features 2 separate ones, one for the Mavic Pro and second for its dedicated controller. Both of them sport the same design and are extremely lightweight and have a compact form factor. In terms of build quality, you can be sure both of these cases are straight on point since they’re made out of Nylon and polyester materials. A sturdy, outer shell keeps your drone safe and sound from impact… plus, it’s water resistance as well, meaning your Mavic Pro will not be damaged if it’s raining. All in all, Philonext’s cases are a good choice for all of you. They might not be the best ones out there, but considering their price tags, they’re an outright steal! If you are looking for the ultimate protection, then this one is made for you! It is made out of engineering plastics that is not only waterproof and shockproof but also extremely durable as well. Actually, I’m sure you will figure this out on your own as soon as you lay your eyes on it. Moving forward, it sports precise cutouts for all your Mavic Pro accessories, nicely fitted into a padded inside. 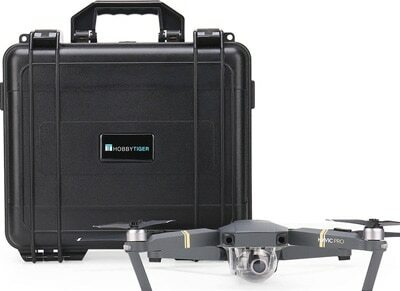 As far as the cutouts are concerned, Cheerson Hobbytiger Hard Case supports Mavic Pro, controller, all the necessary cables and even 2 additional batteries. The exact proportions of this case are as follows: 15.59″ x 13.38″ x 4.72″(32cm x 34cm x 12cm). It has a safety lock mechanism at the top as well as a sturdy handle and a fancy Hobbytiger logo in the middle. It is safe to say that Drone Pit Stop did a great job with this case. 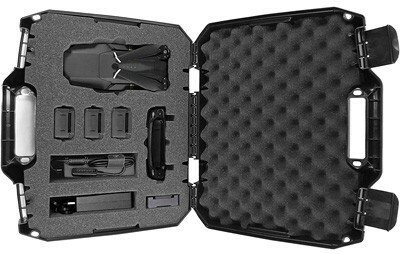 Not only does it fit all your Mavic Pro accessories (including the charger, controller, cables plus 2 batteries) but it also secures them into position with precise cutouts and extra padding on the back. In addition to all those items, there’s actually extra cutouts designed specifically for your SD and Micro SD cards. Talk about thorough planning, eh? Regarding build quality, Drone Pit Stop did an excellent job. Their case is waterproof and has a durable zipper that won’t give up after a couple of drags. The best thing about the design is the fact that it’s been built out of just 2 bodies, ensuring maximum durability. The folks over at Drone Pit Stop really thought of everything and they’re 100% sure you will like their product. If you don’t, you can ask for your money back and send the case back via mail. At the number one spot we have quite a show for you – the SmaCase D500 by Smatree. This all-in-one case features an excellent, stylish design that is able to support a massive number of accessories as well as all main devices. So, if you want to place your drone, controller, charger, 3 accessories and all necessary cables, then SmaCase D500 is for you! When it comes to the design and build quality, you can be sure all your items inside are safely protected. That’s because it is made out of high density EVA material that are ensuring maximum safety. The exact dimensions are as follows – 32.2*23.7*11.2 cm (12.7*9.3*4.4 Inch). As far as I’m concerned, Smartree SmaCase D500 is one of the best (and most durable) DJI Mavic Pro cases out there. Personally, I have been using it ever since it came out and I must say I am absolutely thrilled with it! The biggest problem of hard cases and regular cases is lack of space for additional things. For a person who uses both wall and car charger and has several separate batteries, those cases just can’t cut it. Even a few extra cables are too much for those precisely cut hard cases. If you’re one of those people who demand more, then it’s the backpacks side of the story you should be checking out. For example, this outstanding backpack by Koozam is a real problem solver. Not only does it sport a great design but it also comes in 2 colors, silver and gray. It features foam cutouts for a lot of parts. 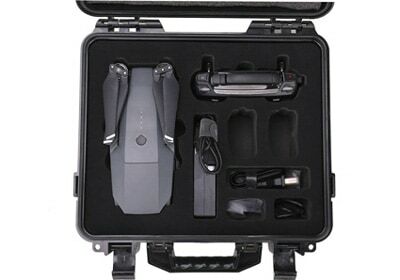 More precisely, Koozam backpack can fit DJI Mavic Pro (together with a battery), 3 additional batteries, transmitter, charging hub and all necessary cables… and that’s only in the main compartment. There’s also enough room to squeeze in a tablet for FPV as well as a bottle of liquid inside a mesh compartment on the side. 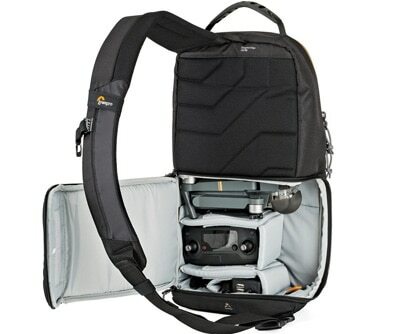 If ergonomic and comfortable DJI Mavic Pro backpack is your thing, then you will love Slingshot Edge 250AW by Lowepro. It is a bit bigger than you’d initially think. That is not necessarily a bad thing since bigger size allows you to pack more things. With that being said, Slingshot Edge 250AW comfortably fits all DJI Mavic Pro accessories just like the one from Koozam. Besides DJI Mavic Pro, Slingshot Edge 250AW is design to hold a DSRL with a set of different lenses as well as a tablet. Whichever you choose this backpack for, good news is that it possesses a solid anti-theft feature in the form of body-facing zipper of the main compartment. It comes in 2 sizes, this one (250AW) and 150AW which is slightly smaller. Finally, I should also mention that, as its name suggests, it has AW (all weather) cover which means neither snow or rain can damage stuff inside. At the number one spot we have quite a show for you – the SmaCase D500 by Smatree. 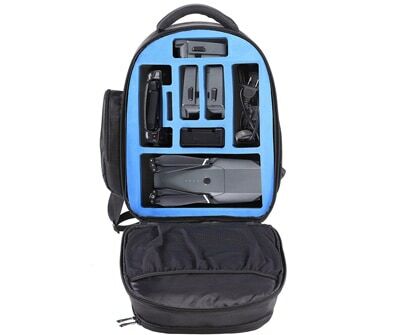 Even though this all-in-one case isn’t a fully-fledged backpack (it’s actually DJI Mavic Pro shoulder bag), considering the fact it comes with lengthy shoulder straps, it can definitely serve the purpose. Smartree SmaCase D500 features an excellent, stylish design that is able to support a massive number of accessories as well as all main devices. So, if you want to place your drone, controller, charger, 3 accessories and all necessary cables, then SmaCase D500 is for you! When it comes to the design and build quality, you can be sure all your items inside are safely protected. That’s because it is made out of high density EVA material that are ensuring maximum safety. The exact dimensions are as follows – 32.2*23.7*11.2 cm (12.7*9.3*4.4 Inch). As far as I’m concerned, Smartree SmaCase D500 is one of the best (and most durable) DJI Mavic Pro cases out there. Personally, I have been using it ever since it came out and I must say I am absolutely thrilled with it! 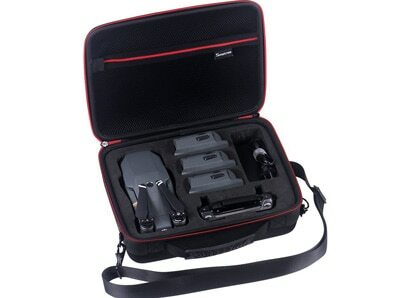 You are not ready to spend an entire fortune on that premium hard case by Nanuk? Well, that’s alright because there are other, much cheaper options available. For instance, you can go for Casematix Dronesafe. 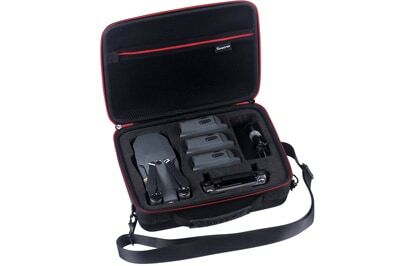 This is a rugged hard case that fits a whole bunch of stuff inside. Moving forward, the 2017 edition of this case packs a brand-new three-layer foam which provides excellent cushioning for your belongings. Whether you bump it, drop it or in any other way create an impact, things inside will remain undamaged. You’ll also notice (if you purchase it, of course) that the foam doesn’t have any cutouts at all. That’s where the fun starts. You see, you get to design everything according to your wishes. So depending on your needs and the amount of batteries (extra accessories) you have, you can tailor these to suit your needs. Unfortunately, Dronesafe by Casematix is not a waterproof case. A mild rain probably won’t do any damage, but heavy rain or submerging in water surely will. Another drawback is the fact it does not come with a shoulder strap, just a handle… but that’s nothing problematic as you can always tie a strap to the handle and you’ll be good to go. If you are looking for the ultimate protection, then this one is made for you! It is made out of engineering plastics that is not only waterproof and shockproof but also extremely durable as well. Actually, I’m sure you will figure this out on your own as soon as you lay your eyes on it. Moving forward, it sports precise cutouts for all your Mavic Pro accessories, nicely fitted into a padded inside. 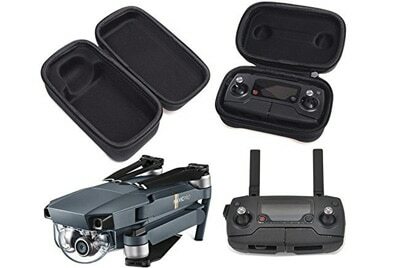 As far as the cutouts are concerned, Cheerson Hobbytiger Hard Case supports Mavic Pro, controller, all the necessary cables and even 2 additional batteries. The exact proportions of this case are as follows: 15.59″ x 13.38″ x 4.72″(32cm x 34cm x 12cm). It has a safety lock mechanism at the top as well as a sturdy handle and a fancy Hobbytiger logo in the middle. How much are you ready to pay for your Mavic Pro’s ultimate safety? Well, if that number goes above $100 then Nanuk Hard Case is your go-to option. Not only is it the ultimate guard for your DJI Mavic Pro and all of its accessories, it also comes in several different flashy colour options. With IP67 waterproof rating, you don’t have to worry about rain or snow getting through this thing. As a matter of fact, you can leave Nanuk Hard Case submerged 3 feet in water for up to 30 minutes and there will be no damage to your belongings (try this at your own risk though). That’s because of a safe closing fit and a power claw latching system that’s used on all Nanuk’s cases. The inside incorporates precise foam cutouts while the outside is made out of highly resistant NK-7 resin for ultimate durability. It is not that heavy either, but you’ll still notice it more than other standard cases. 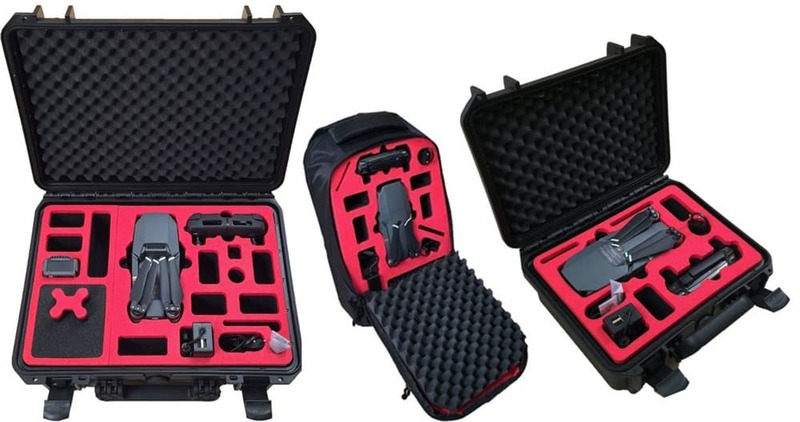 All in all, if you are a sloppy person and you’d like to invest in the well-being of your new drone investment, then Nanuk Hard Case should be your next one! Besides these 5, as you’ll probably see for yourself, there are more than plenty DJI Mavic Pro cases available on the market. 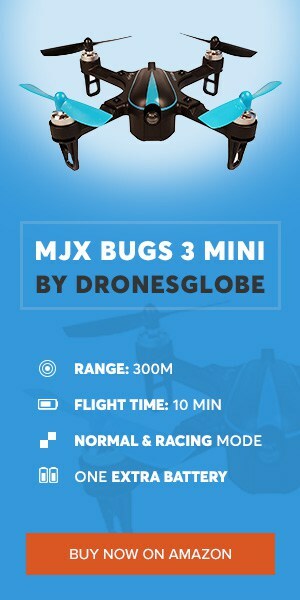 Despite that, these 5 still provide the best bang for the buck, ensuring you have the optimal carrying potential for your new drone. As I already explained above, picking the right one can be quite a hefty task, but I’m sure you won’t have any problems with the list below.